Vanilla is everywhere. It’s in pretty much every baked good and as a scent for candles and air fresheners. If you think it’s just a humdrum spice that’s nothing special, you’ll be surprised at its long and complex history. 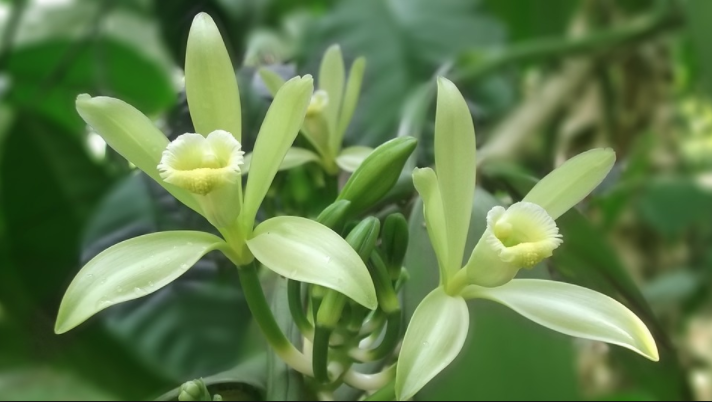 Vanilla is from the orchid family. The fruit is a seed capsule with little black specks you might recognize from good ice creams. The pod and seeds are used in cooking. The Totonacs in Mexico cultivated the plant first, and then when the Aztecs took over, they fell in love with it. Vanilla flavored the famous chocolate drink and the conquered Totonacs were required to grow the flower to honor Montezuma, the Aztec king. When Cortez arrived, he took chocolate and vanilla back to Europe with him. Europeans began growing vanilla in their botanical gardens, but to their dismay, the plant never grew its fragrant and delicious seeds. Their failure was called “the curse of Montezuma.” In 1836, a botanist figured out that the plant’s natural pollinator, the Melipona bee, didn’t live in Europe. Without pollination, seeds never grew. In 1841, a slave on a tiny volcanic island developed a way to hand-pollinate the plant. It’s tricky work, but it spread to Madagascar and even back Mexico. Even before Europe adopted the hand-pollination method, they were using seeds and pods grown overseas. In the 17th century, a candy-maker developed sweetmeats flavored with vanilla, and Queen Elizabeth I loved them. After sampling vanilla ice cream in Paris, Thomas Jefferson took the recipe back with him, where it’s now in the Library of Congress. Flavored ice cream was all the rage for decades, and became a crucial ingredient in soft drinks, especially Coca-Cola. Vanilla is the most expensive spice in the world at $300 a pound. Only saffron is pricier. Why? Getting it is a lot of work. In its natural environment, vanilla grows as a clinging vine that can reach up to 300 feet. The flowers, a pale yellow-green, open for only 24 hours. If they aren’t pollinated, they die. When they are pollinated, the fruit grows, with all its flavors. With a tiny window, human workers pollinate rapidly by hand. To meet demand, scientists experiment with synthetic vanilla and vanilla from other sources. The compound is known as “vanillin,” and it can be derived clove oil, wood pulp, other plants, and even cow feces. Creating synthetic vanilla is a lab is even easier, and significantly cheaper. Around 20,000 metric tons of the fake stuff gets produced in a year. To get natural vanilla, you have to turn to three major places: Madagascar, Mexico, and Tahiti. Madagascar grows the vast majority, as well as the best. It’s known as Madagascar Bourbon. Mexico, despite being spice’s home, produces much less. You can find spicy Mexican vanilla, which has a warm flavor with hints of chocolate and cinnamon. Tahitian vanilla is the lightest, with flowery and fruity notes. The forces of nature put pure vanilla at risk. In March of 2017, a cyclone struck two crop regions in Madagascar, destroying between 80-100% of the plants. Other factors like economics and trade tensions threaten the spice, too, so you may have to get used to artificial flavoring in your ice cream. By hand-pollinating vanilla, humans changed how the plant reproduces. What other fruits and vegetables have changed over the years?